AFF 2019 poster theme reveal event at the Market House. Video by JT Torres, TalentKey Video. 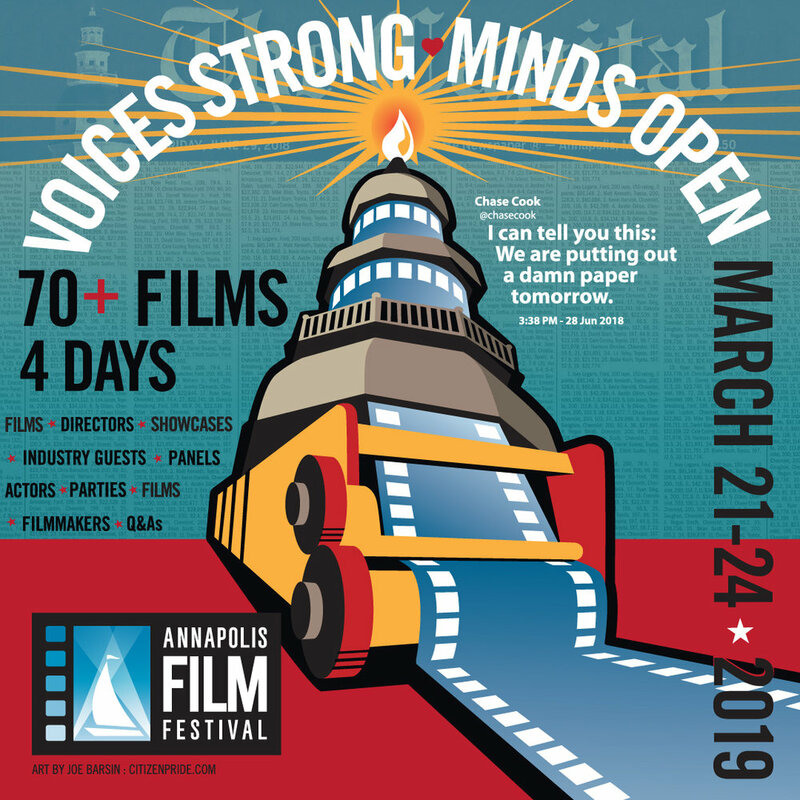 Recently, The Annapolis Film Festival revealed the new 2019 theme poster created by the Fest’s Art Director, Joe Barsin of JEB Design & Citizen Pride, at the newly renovated Market House near City Dock in Annapolis. AFF’s Creative Directors, Lee Anderson and Patti White, introduced Barsin and his seventh poster he has created for the Fest since its founding in 2013 (See poster series here). The Capital Staff on cover of TIME magazine’s 2018 Person of the Year. More is explained in this video but the poster and the entire theme for AFF is dedicated to our friends who died at The Capital this past June. The tagline, Voices Strong. Minds Open., speaks to the spirit of the Free Press which was acknowledged, a few days before this reveal, by The Capital being named TIME Magazine’s Person of the Year: The Guardians and the War on Truth. One of the many graphics created by Joe Barsin to promote the Annapolis Film Festival new theme. See you all March 21-24, 2019! Learn more and Get your tickets here. Announcing the new theme for AFF with Joe Barsin (Art Director), Patti White and Lee Anderson (Creative Directors and Founders of AFF). The newly renovated Annapolis Market House was packed for the AFF theme reveal. AFF Team: Lee Anderson (Creative Director/Founder), Parabh Gill (Board Member), Patti White (Creative Director/Founder), Elizabeth Lietchty (Board Member), Joe and Eva Barsin (Art Directors, JEB Design). Joe Barsin signing the, limited edition, Annapolis Film Festival posters.